On October 30, at the Miyako-jima Municipal Office, Yoshikazu Nakamura (left), Mitsubishi Motors Corporation director of domestic sales and Miyako-jima Mayor Toshihiko Shimoji signed an agreement on the promotion of electric vehicles. On October 30, the Miyako-jima Municipal Office and Mitsubishi Motors signed an agreement on the promotion of electric vehicles (EV). They will strive to spread the use of EV, using initiatives such as installing fast chargers for these vehicles in the city’s main tourist attractions. It is the first time that an automobile manufacturer has entered into such an agreement with a local government to promote the use of EV in the prefecture. In order to reduce carbon dioxide emissions, in 2008 Miyako-jima Municipal Office declared the island to be “Eco Island Miyako-jima,” and set the goal of EV accounting for about 40% of the vehicles on the island by 2030. Under this agreement, they will cooperate in measures to spread the use of these vehicles. The municipal office will set up quick chargers at four places in the city for tourists before the end of the 2012 fiscal year. 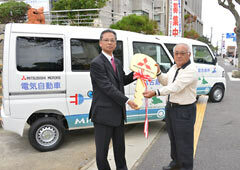 Miyako-jima City Mayor Toshihiko Shimoji commented, “Electric vehicles have become more popular in Miyako, but still not to the extent that we want to see. We want people here to become much more familiar with EV, in a way that sees them more connected with our citizens. Working with Mitsubishi Motors, we would like Japanese and foreign people to understand what is good about these cars. Yoshikazu Nakamura, the director of domestic sales for the company said, “I think that electric vehicles are a perfect fit for a small, remote island where drivers travel short-distances and gasoline is expensive. I also want people to make effective use of portable batteries at times of a disaster such as typhoons.” The company is allowing the prefectural office to use two electric minicabs at no charge.